Update: This post includes data from 2015/2016 but the concepts are still very relevant today. Especially, given the current basis situation on soybeans specifically. Now is a good time to review the price protection you receive from your Revenue Protection crop insurance. The actual price protection provided by crop insurance is often misunderstood. Let’s look at an example from the 2015 growing season. This producer went on to explain that he was comfortable doing no marketing because his crop insurance was protecting the market price for him. He was correct in theory but his understanding of the level of this price protection was incorrect. 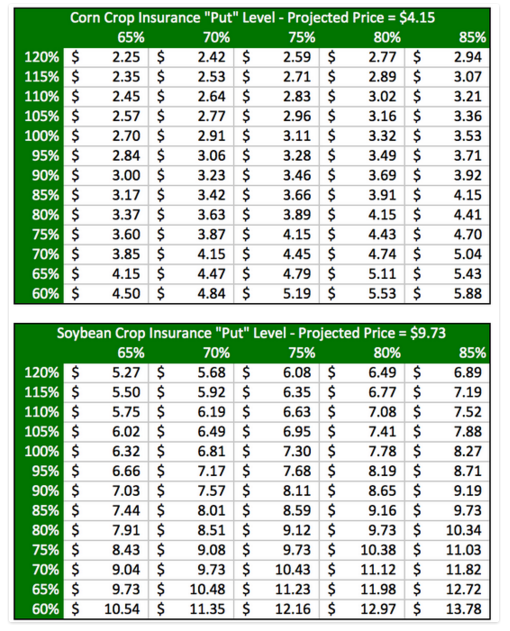 Let’s assume the fall price is below the spring price ($4.15) so the producer’s actual crop insurance revenue guarantee matches what is shown above ($581). If this producer produces an actual yield that matches their APH, crop insurance won’t provide price protection until December corn futures fall below $3.32. You determine this by dividing the revenue guarantee by the actual yield ($581/175 = $3.32). $3.32 futures would be the “strike price” of the put option embedded in this producer’s Revenue Protection crop insurance. This strike price fluctuates with yield changes. See below for a chart I put together that calculates the strike price of various coverage levels at different yields (top axis = coverage level, left axis = yield as a percent of APH). When I spoke with the above mentioned farmer (not a client), December 2015 corn futures were trading at $4.40/bushel. The producer was relying on his insurance for price protection but that price protection was more than $1.00/bushel below the market price. For his operation, that was $175 of risk per acre! 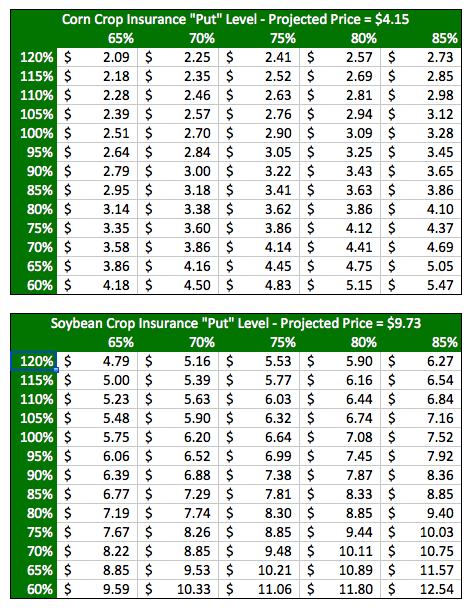 Now lets review 2016 crop insurance “put” levels. We don’t need to over-analyze these numbers. At any yields close to average, they are terrible! 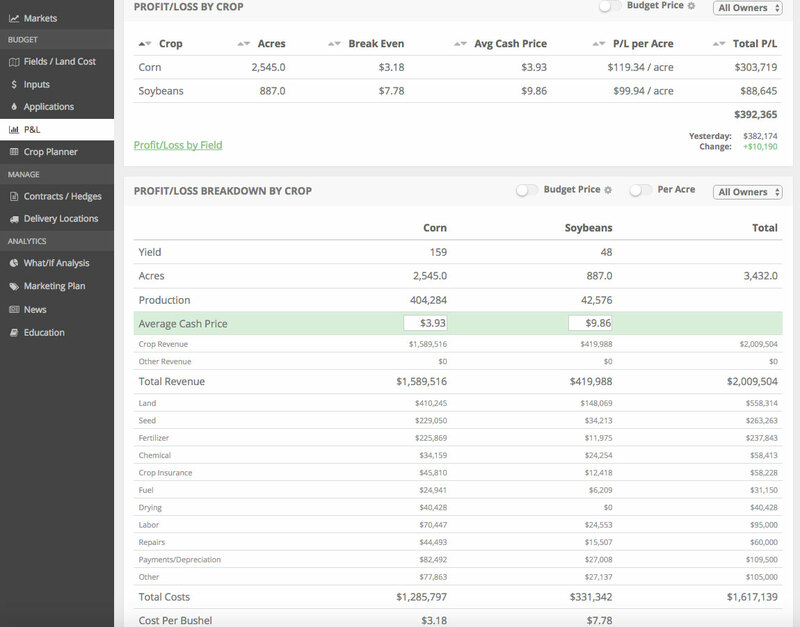 Before relying on crop insurance to protect your revenue you need to estimate your crop yield. As a rule of thumb, your crop insurance’s put strike price will be ineffective if you have a yield greater than 90% of your APH. In most instances crop insurance is poor price protection. While crop insurance is an important piece of your farm finance management, don’t use it to neglect your overall revenue/risk management. As always, don’t hesitate to reach out if you have any questions. Don’t forget to sign up for our newsletter below if you haven’t already!